Ragi Dosa chaat is a fusion of South and north Indian food similar to Idli Chaat. Will the kids ever say okay to Ragi Dosa??? No way. 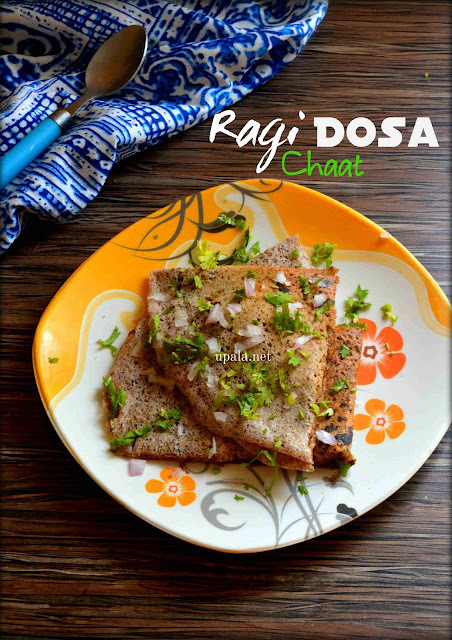 This Ragi Dosa Chaat recipe is the easiest way to make your kids eat something really good. Ragi is calcium rich and diabetic friendly too. Calcium is one of the demanded nutrition for the growing bones of your little ones. I have already posted Ragi dosa batter recipe, Where in I have used 1 cup idli rice and 1 cup ragi flour. For detailed recipe,Click here. 1) Heat a dosa tawa and spread oil on it. 2) Take a ladle of Ragi dosa batter and spread it in circular motion. 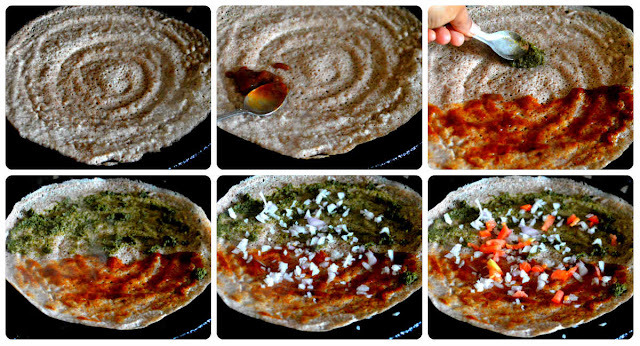 3) Apply sweet chutney on one half of dosa and green chutney on other half. 4) Sprinkle onions and tomatoes on the dosa. 5) Drizzle oil on sides and close the dosa with a lid. 6) After the dosa is cooked and turns crispy, close one half over other and cut them into pieces as shown in picture. 7) Serve the Ragi dosa by sprinkling few onions and coriander leaves. Yummy Ragi Dosa chaat is reasy..
1) If you don't have ragi dosa batter, then try adding few ragi flour to left over idli/dosa batter. It reduces the sourness of the batter as well as a healthy ingredient is added to it.